During the Obama administration, conservative state officials frequently used litigation to attack progressive policies they opposed. Now, they have found a willing partner in the Trump administration. When sued by these state officials, the administration has often sided with them in litigation or used its executive authority to help advance the state officials’ goals. Conservative state officials have attacked a broad range of important protections. Last year, for example, the Trump administration responded to a state suit by abandoning overtime pay protections, which will result in a $1.2 billion pay cut for workers each year. More recently, the Trump administration joined conservative states’ efforts to undermine pre-existing condition protections for millions of Americans; 17 progressive state officials, led by California Attorney General Xavier Becerra, have stepped in to defend the law. The Trump administration is also seeking to allow greater amounts of toxic mercury into the air by attempting to eliminate the legal basis for a mercury emissions regulation that states have challenged in federal court. The regulation prevents up to 11,000 avoidable deaths each year. These efforts will not only result in significant harms nationwide but will also hurt the residents of the very states involved in the litigation. This column considers each of these three efforts and their consequences. The U.S. Department of Labor (DOL) sets the standards by which employees are required to be paid time and a half when they work more than 40 hours in a week. Prior to the Obama administration, the standards had not been updated in years, meaning that workers making as little as $23,660 per year could be denied overtime pay. To address this problem, in 2016, the DOL expanded overtime pay protections to people making less than $47,476. 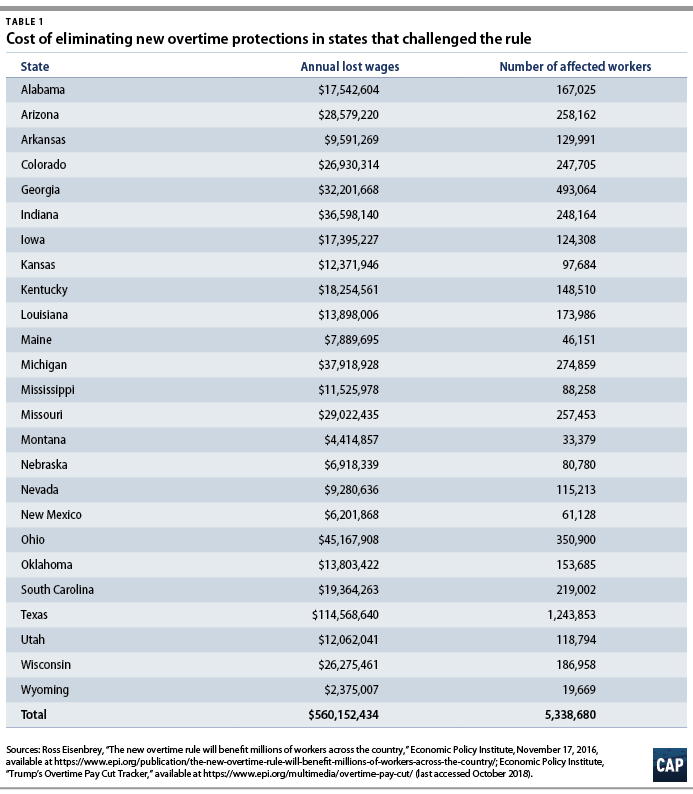 The rule would have provided or strengthened overtime protections for 12.5 million workers across the country that year. In response, 21 conservative states, led by Nevada Attorney General Adam Laxalt, brought suit to block the rule and eliminate its overtime protections. In an effort to find a district court judge favorable to their argument, the 21 states brought their suit in a specific court in Eastern Texas. Officials from four other states, led by Missouri Attorney General Josh Hawley, later joined the effort. When the Texas judge issued a highly questionable ruling overturning the rule in 2017, the Trump administration declined to defend the rule, effectively abandoning its protections. Prior to the Affordable Care Act (ACA), insurance companies frequently discriminated against people with pre-existing conditions by denying them coverage or charging them outrageous prices. The ACA put an end to that by prohibiting discrimination against people with pre-existing conditions. Since its passage, the ACA has been under unrelenting attack from conservative opponents. Most recently, Congress debated a number of plans to repeal the ACA and strip health care coverage from millions of Americans. Although efforts to totally repeal the ACA failed, Congress did raise premiums and reduce coverage through provisions passed in the 2018 Tax Cuts and Jobs Act (TCJA). And now some states are trying to accomplish through the courts what conservatives could not accomplish through the legislative process. In February, 20 states, led by Texas Attorney General Ken Paxton and Wisconsin Attorney General Brad Schimel, brought a lawsuit arguing that the ACA is unconstitutional because of changes made to the law by the TCJA. The lawsuit has no legal merit—even legal scholars involved in previous challenges to the ACA agree that the challenge is ridiculous. Yet, rather than meet its responsibility to defend the law, the Trump administration has sided with some of the states’ arguments, taking the position that the ACA’s protections for people with pre-existing conditions must be struck down. The administration’s legal argument is so indefensible that three career attorneys at the U.S. Department of Justice who were involved in the case made the rare decision to withdraw from the case before the administration filed its brief. When the Trump administration refused to defend the ACA, a number of progressive state officials intervened in the lawsuit to argue in favor of the law. 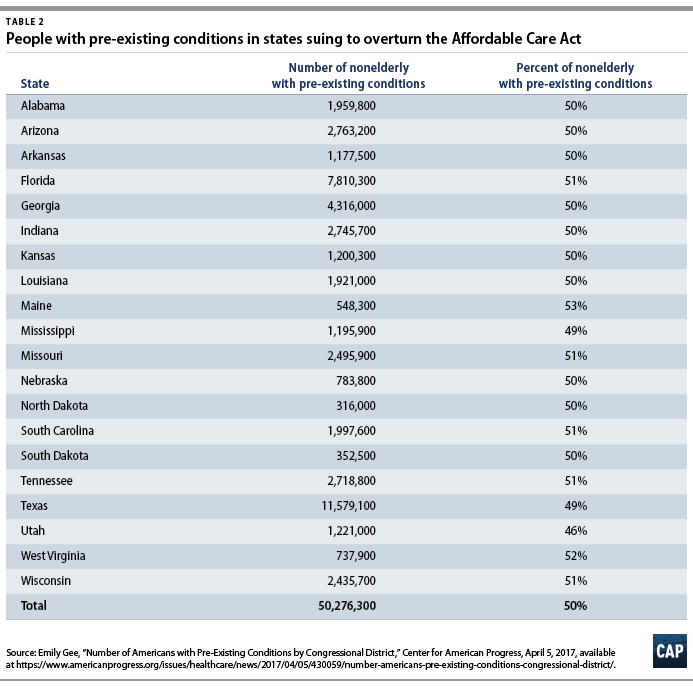 If conservative states win their suit, the ACA’s protections for people with pre-existing conditions would be eliminated, as would a number of the law’s other popular provisions, such as the Medicaid expansion. About 130 million nonelderly Americans have a pre-existing condition; the loss of the ACA would put them at risk of discrimination if they purchased health care in the individual market. There are more than 50 million peoplewith pre-existing conditions in the states that are currently seeking to overturn the ACA. During the Obama administration, the Environmental Protection Agency (EPA) sought to address the problem of toxic air emissions from power plants. Mercury is a dangerous toxin that can cause brain and nervous system damage, especially in children, as well as impede fetal development. 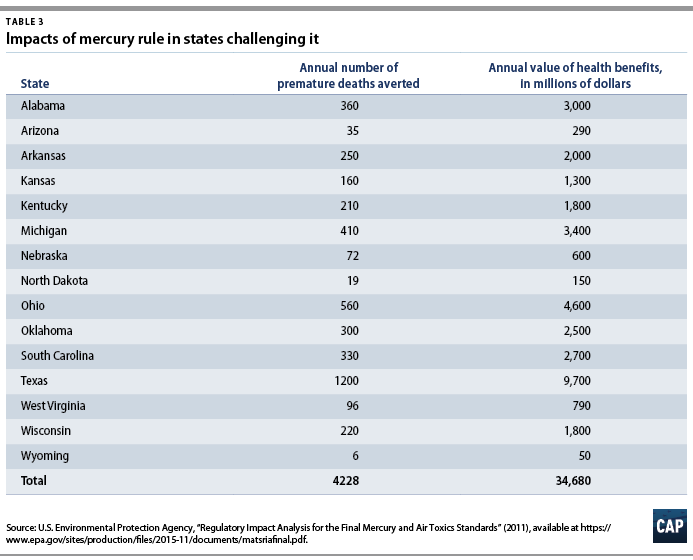 By limiting coal-fired power plants’ release of mercury into the air, the Obama administration’s Mercury and Air Toxics Standards (MATS) rule results in up to 11,000 fewer deaths per year by the EPA’s own estimate, as well as 130,000 fewer asthma attacks and $90 billion in health benefits. The outcomes of these state-brought suits will have real-world consequences for millions of people, including those living in the states seeking to overturn these vital protections. Because of one lawsuit, millions of workers will receive lower pay, while two other lawsuits could have devastating impacts on people’s access to health coverage and their physical well-being. But rather than stand up for the people who would be affected, the Trump administration has committed itself to helping state officials eliminate these important protections.